There aren’t many physical reminders of the 4000 years presence of humans on Daniel Island, not even from the 300+ years since colonization. We have stately rows of live oaks planted to delineate 18th century property lines, but no buildings or landmarks survived the island’s changing economic face from plantations to truck farming to cattle ranch and hunting preserve. What hurricanes like Hugo didn’t level, the next wave of change and progress did. The biggest change of the face of the island has obviously been since the building of I-526 made today’s planned community possible. But just out of sight, on the fringes of that development, are four reminders of those who came before us. Gravestones stand silent vigil in the stillness at the edge of marshes and the Wando River. Sentries of centuries past poking through the mist and the weeds. 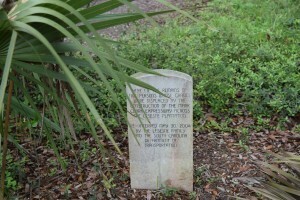 The four cemeteries are scattered from Ralston Creek in the Daniel Island Park neighborhood to just off Raven Creek. Two are behind the Family Circle Stadium. Only Alston Cemetery is easily accessible by car just off Ralston Creek Street. The other three…Simmons, The Grove and Lesesne are scattered along the Wando or adjacent marshes. They’re near the walking trails but not easy for the elderly or infirm to reach. Lesesne, on the banks of the Wando behind the Family Circle, differs in several ways. It contains graves (dating back to the 1700s) of the Huguenot Lesesne family, which has endowed a fund for upkeep and maintenance. 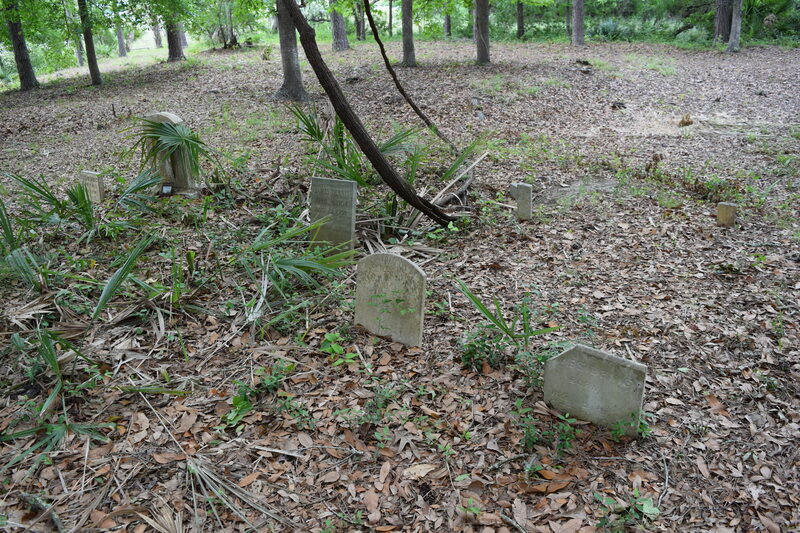 Some of the graves were relocated from a previous site because of the construction of I-526. Although there’s a striking stone obelisk commemorating the site, the Wando is encroaching on the graves. 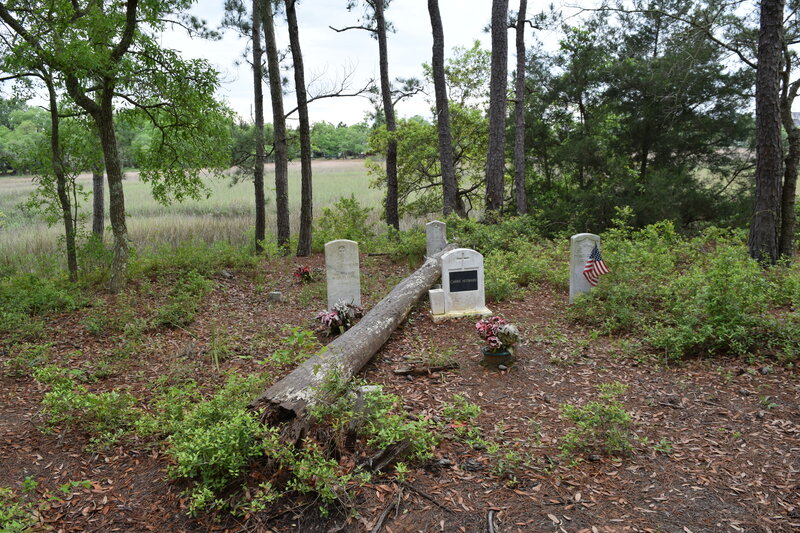 The other three sites are all on the fringe of tidal creeks and marshes and contain graves of African Americans dating from reconstruction to the 1970s. Among the most poignant are headstones for military veterans who served in “colored” regiments, including at least one Civil War veteran. Prominent in two of the three are tombstones of members of the extended family of famed blacksmith and artisan Phillip Simmons. 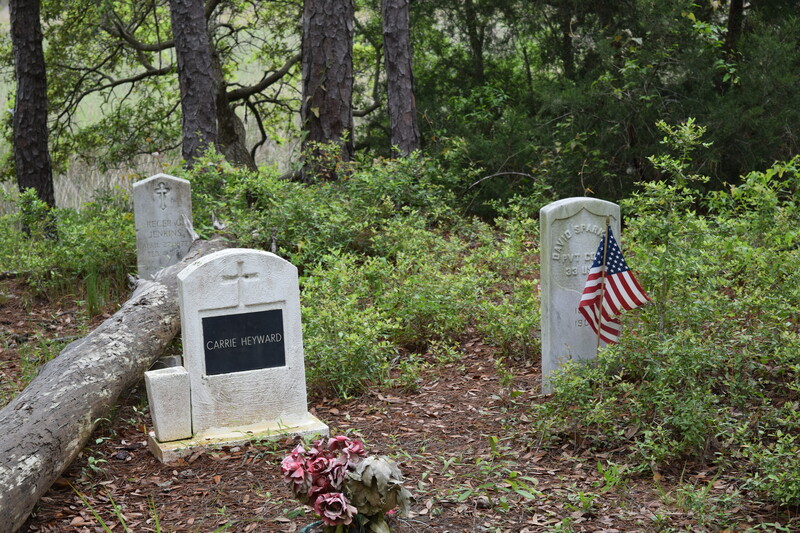 Some of the graves seem well tended with evidence of flowers and flags; others clearly are in disrepair with toppled and illegible tombstones. 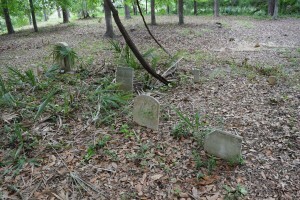 There are depressions that indicate now unmarked graves. How to properly maintain the sites, improve access and rediscover the history of the island through the stories of the people buried in the three cemeteries has been the focus of a several years project involving the Daniel Island Company (which actually owns the land those three sites are located on), The Daniel Island Historical Society, and various individuals and groups representing families of those buried. It’s proving to be a challenging situation. Jane Baker of the Daniel Island Community Fund says her organization has already contributed a total of $10,000 to a coalition of groups including The Gullah Society, Family Tyes South Carolina and Builders of Our Heritage. 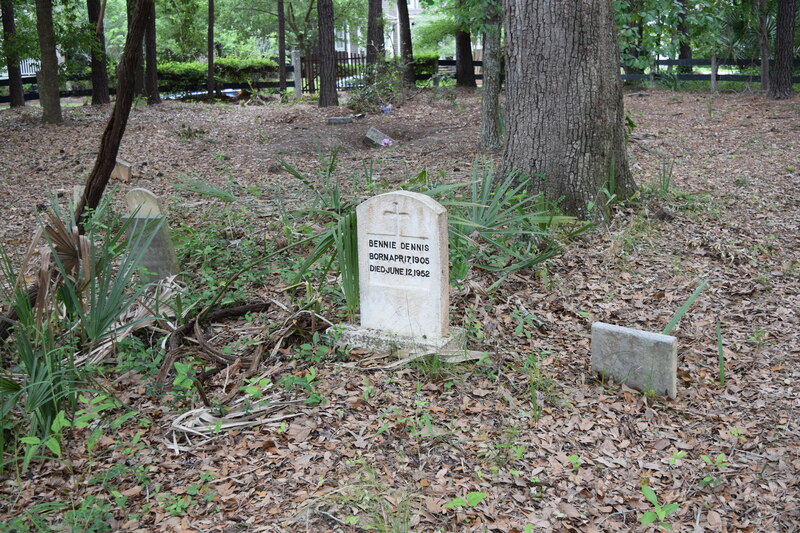 Members of the groups say they’ve laid a foundation to pursue genealogical research, collect oral histories from surviving family members and have proposals that include making the three cemeteries stops along the developing Gullah-Geechee Cultural Heritage Corridor. Dr. Ade Ofunniyin of The Gullah Society (and a grandson of master blacksmith Phillip Simmons) speaks of a “sacred trust” to his ancestors. At a meeting of stakeholders in late May, Baker pushed for a pragmatic agenda beginning with focusing on one cemetery at a time. The consensus of the group was to focus on The Grove. 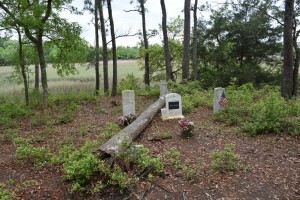 Baker committed the Daniel Island Company to extending a shell path from the new Daniel Island Commemorative Park to the cemetery behind the tennis complex and made clear that the POA would assist in hauling away any debris gathered in cleanup efforts. All agreed that a better fence is necessary and family members offered to get an estimate on an iron gate that would commemorate Phillip Simmons. At last check, there has been no estimate provided to Baker. A family organized cleanup effort was postponed until the Fall. 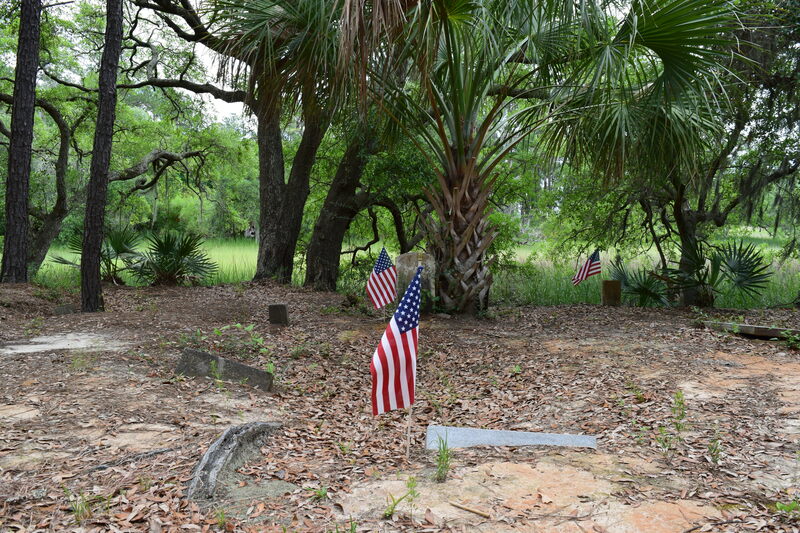 The Daniel Island Historical Society (DIHS) also plans to erect historical markers at each of the burial grounds to help educate the community about those buried there, as well as the general history of the area. Each sign will include a QR code, enabling visitors with smartphones to scan a code that will take them directly to the DIHS website, where they will find additional information on the cemetery. Several members of the Dennis family are buried in the Alston Cemetery. In the background you can see Ralston Creek Street and a simple, but impressive iron gate. Dennis family tombstones in the Alston Cemetery. 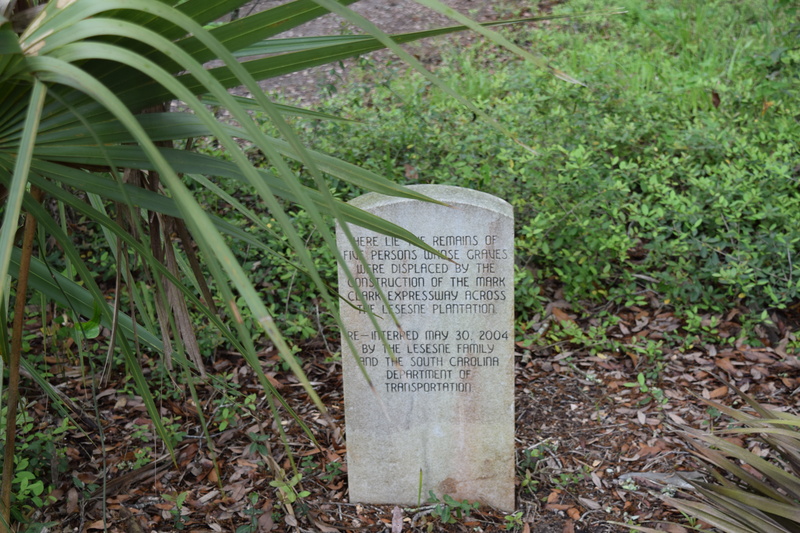 This marker notes the reinternment of graves displaced by I-256 construction….the connecting link that made today’s Daniel Island community possible. The scene at the Simmons Cemetery is a typical view of island cemeteries on the edge of a tidal creek. 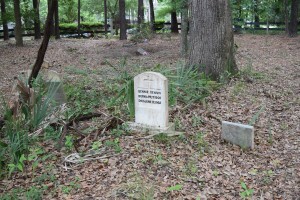 At the right is the tombstone of David Sparkman, a black Union soldier in the Civil War. 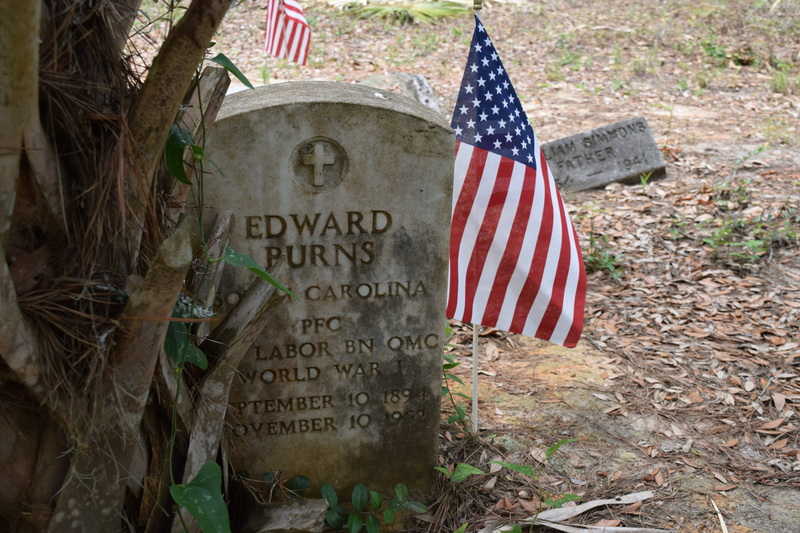 Memorial Day 2015 found a fresh flag on the Simmons Cemetery grave of David Sparkman, a black Union soldier in the Civil War. 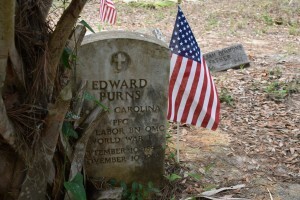 The Grove contains graves of World War I vets and many members of the Simmons family. 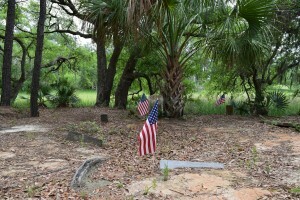 The Grove (behind the Family Circle complex) shows both the ravages of time and climate but also a stand of fresh American flags placed on veterans’ graves.